Half Moon Eyes, Interactive Media Installation with Touchscreen Technology that showed documentation of Cheon's travel to North Korea in 2004. 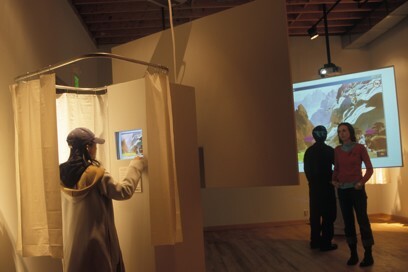 Exhibited simultaneously in the United States and South Korea at the Maryland Art Place, Baltimore and Insa Art Space, Art Council, Seoul, Korea between November 2004 to January 2005. This gallery view is that of Maryland Art Place for the Grace Hartigan's "Athena's Daughters" exhibition.